Today we returned to the Queensland Museum South Bank to visit the world-class Egyptology exhibit that’s on display until 21 October — including four mummies. 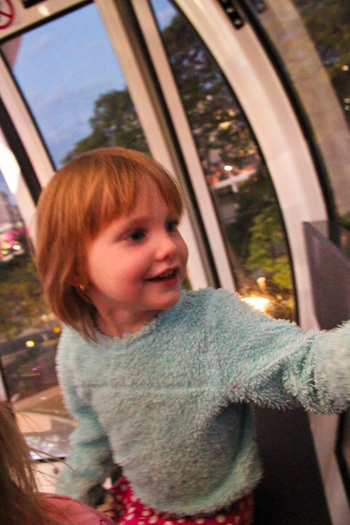 Our outing was also a good opportunity for the girls to see some of the Brisbane Festival exhibits at South Bank, including the light show. 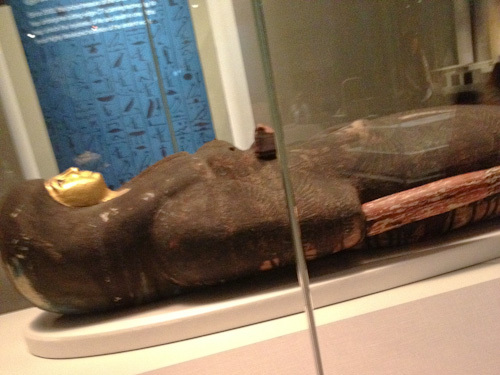 In the museum, we bought tickets to Mummy — secrets of the tomb and entered the small theatre for a 3D film. The mummies on display have never been unwrapped, and yet — using computer imaging — “the details of the skeleton”:http://www.mummy.qm.qld.gov.au/The+Exhibition/The+man+behind+the+mummy#.UFn4Ar__TfY can be revealed. The movie provided a fascinating look at ancient Egyptian life as well as the wonders of modern technology. 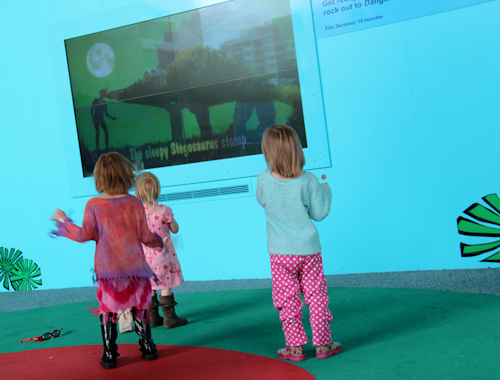 Our girls enjoyed the presentation very much — much more than the actual exhibits. 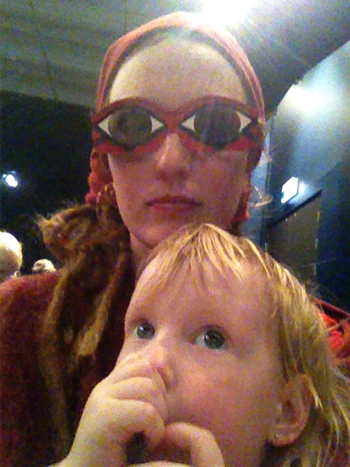 Our 3D glasses are in the fashion of eyes on Egyptian paintings. The Rosetta Stone presents the same text in three different scripts — coptic, demotic and greek, providing modern archaeologists with a key to understanding Egyptian hieroglyphs. 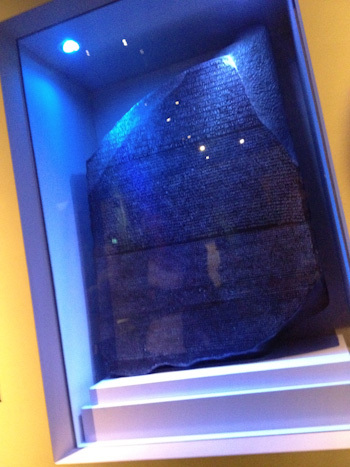 This is a replica as the real Rosetta Stone resides permanently in the British Museum. This small mummy is from a girl-child who worked as a singer in a temple. The resin that covers a mummy darkens with time, and the first Arabs who discovered Egyptian mummies thought the coffins were covered with bitumen or pitch — "mummiya" in Arabic. That's why a mummy is a mummy! Food is not allowed in the museum, so we took a break outside to finish the lollipops we had started (before we found out food was not permitted). 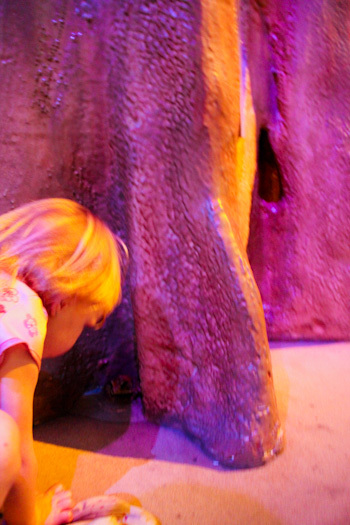 In returning to the dinosaur playground, the girls enjoyed the familiarity of a place they’ve visited before. The girls dance along to the dinosaur stomp as we take a break outside for a lollipop after finishing with the Egyptian exhibits. Visiting a museum with young children is a best done in several trips, and today I just followed the girls around as they started to explore more of the floors. We took some maps and used them to navigate our way around. 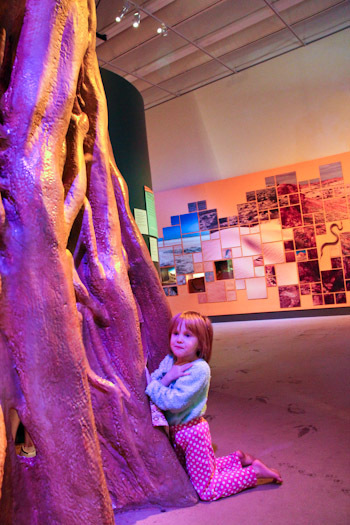 Calista finds a creature crawling up the replica strangler fig tree. Dell greets a frog at the base of the tree. 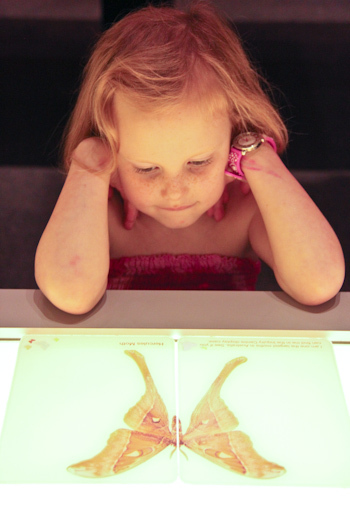 Brioni discovers her new favourite moth/butterfly — the huge Hercules moth. These exhibits of pinned insects remind me of the cases on display in the dispensary at Kent Academy in Nigeria — my first boarding school. 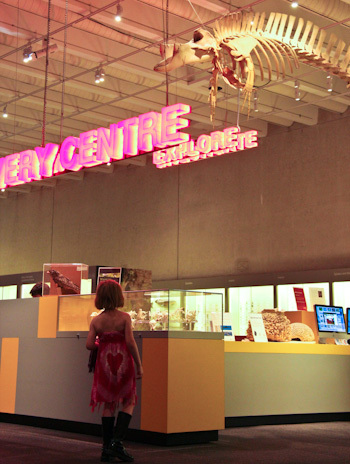 In entering the Discover Centre, the girls are given the opportunity to engage in activities related to exhibits. 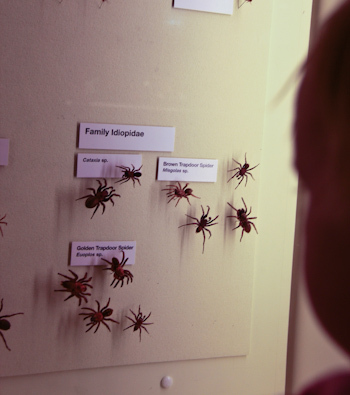 Dell examines a selection of spiders. She doesn't really like them. 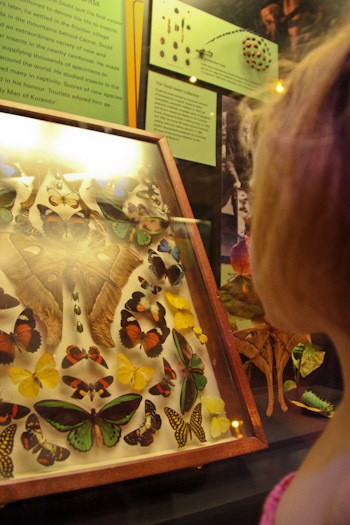 Brioni finds the Hercules moth again. 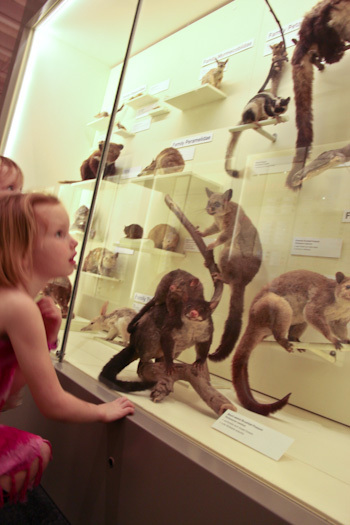 A large number of native animals are on display in cases. 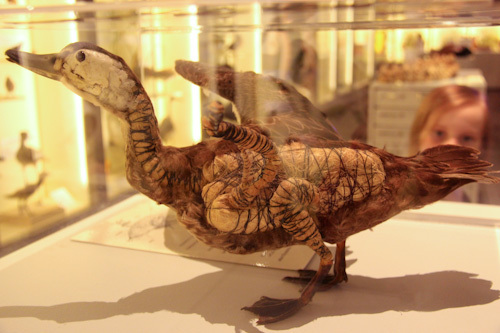 A duck is on display to show what the inside of stuffed specimens looks like. 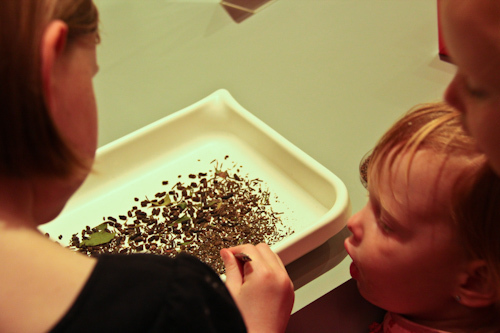 The Discovery Centre has a huge quantity of live stick insects on display, and we were invited to have a turn at picking out the stick-insect eggs from a tray of droppings collected from the bottom of the insects’ cages. Aisha starts looking through the tray of eggs and droppings. Soon, everyone is having a go with the tweezers. 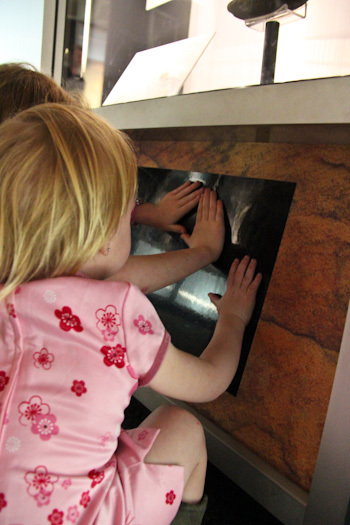 The girls place their hands against the heat-sensitive screen to leave a hand-print in the tradition of Indigenous Australian artists. 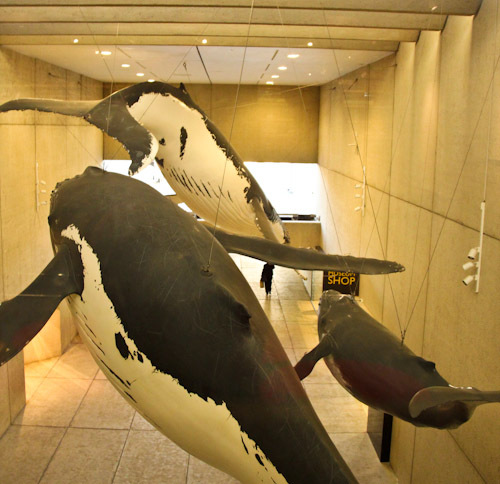 Life-sized humpbacks hang in the breezeway and their recorded songs echo down the corridor. We explored the museum for four hours and only left because the venue was closing. The staff were friendly and not oppressive — probably a tricky balance in that venue! Given that this was such a positive experience for the girls, we’ll try to come back again while we’re in town. 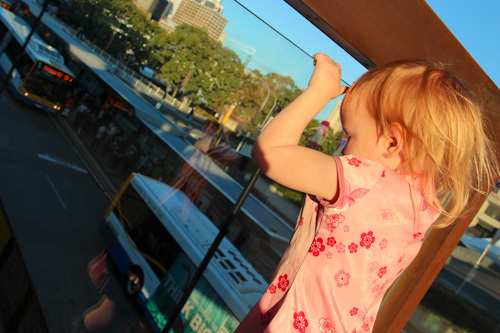 Dell watches the rush-hour traffic below her. 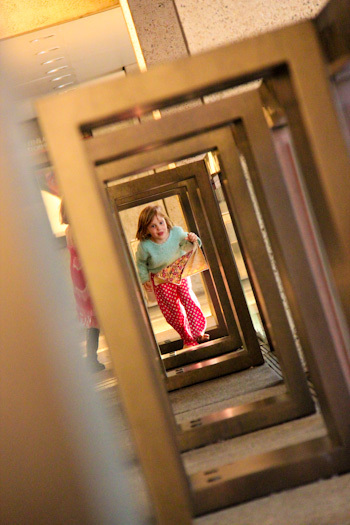 A series of rectangular bar tables outside QPAC forms a fun tunnel. 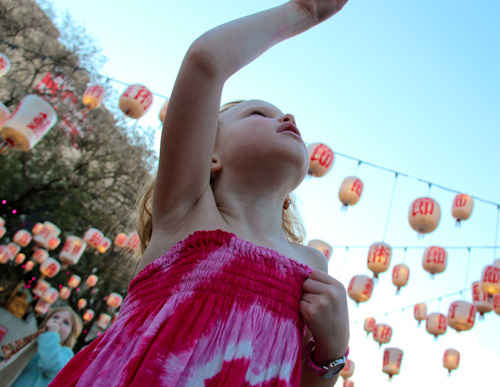 The girls point out their favourite lanterns. 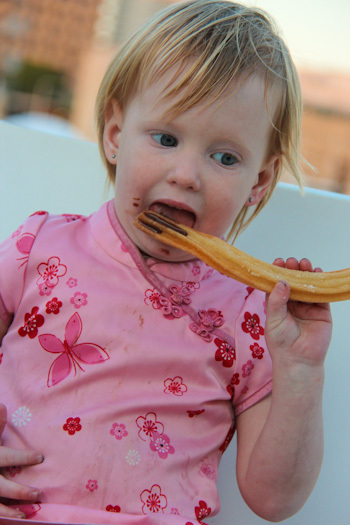 Once getting over their disappointment that the Spanish donuts aren't round, the girls appreciate the churros. 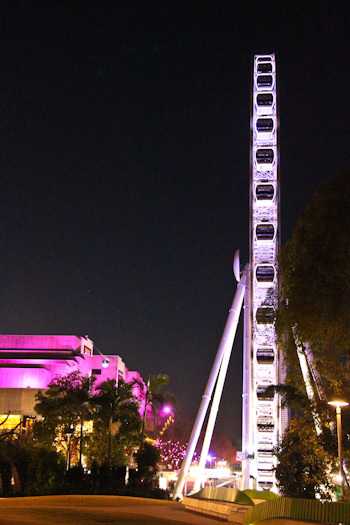 The Wheel of Brisbane beckons to us for a ride. Brioni delights in the high ride. 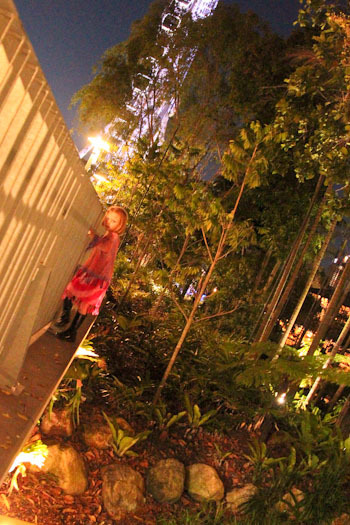 Calista loves pointing out the scenery. 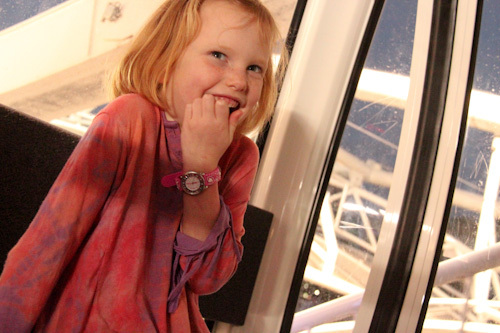 Aisha is distressed by the noise in the gondola and contributes to it as she repeatedly instructs us all to be quiet. 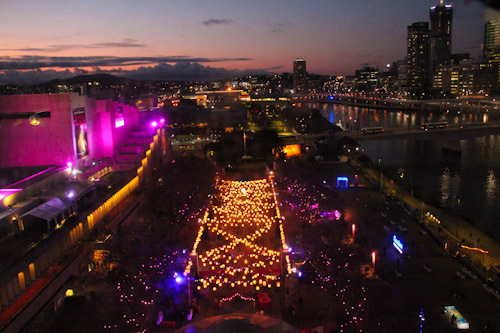 The Brisbane Festival exhibits dress South Bank in a petticoat of fairy lights. 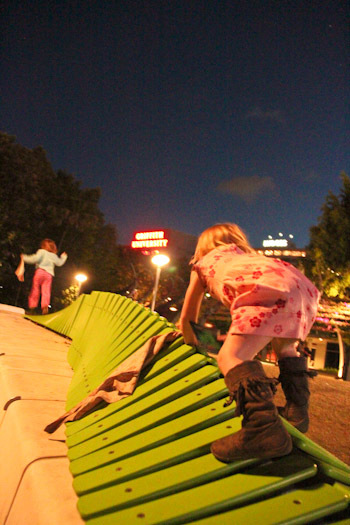 Staying out late in the evening is fun for the girls, and as the weather warms up, it’s perfect for playing. We had a long wait before the scheduled light show, but I sat next to a playground and let the girls do what they like to do best! 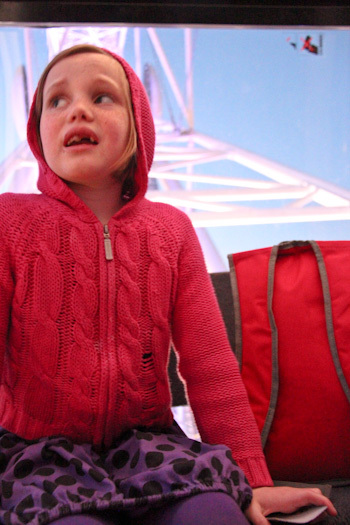 All structures are play-equipment for energetic little girls. Brioni detours from the main path when she finds it too tame. 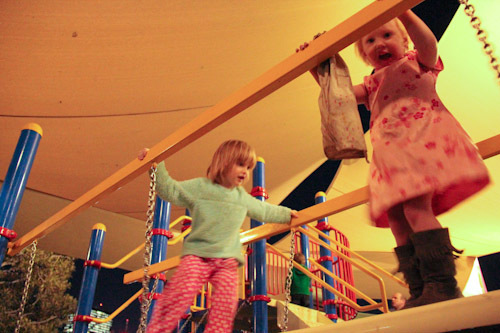 The girls are happy on the playground while we wait for the laser light show to start. The laser show features around a barge in the centre of the Brisbane River which spouts water that reflects the lights. The two younger girls fell asleep on the drive home — with dreams of fairy lights dancing in their heads. 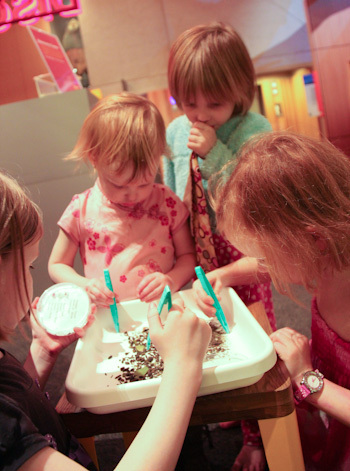 Aisha and Brioni have a new interest in archaeology, and we’ll soon be looking for our own treasures to excavate! This is a fabulous record of your day. We went to a very similar (maybe the same?) 3D mummy show at the British Museum several years ago. We really enjoyed it too. Nice! Great shots of the girls. And cool glasses!